French Market Soup | Let's Eat! This is a recipe that was given to me from my friend Peggy Davenport many years ago. It’s one of the few recipes that I haven’t modified over the years. This is a great way to use leftover ham and the ham bone that often goes in the trash after the ham is carved. You have to start this the night before but it’s worth it! You can follow the quick soaking method on the back of the bean package if you don’t have that kind of time, but it takes about 2-3 hours. Wash beans and place in a Dutch oven. Cover with water 2 inches above beans and let soak for 8 hours. Drain soup mix and return to Dutch oven; add 2 quarts water and ham hock. Bring to boil; cover, reduce heat and simmer for 1 1/2 hours until beans are tender. Stir in tomatoes and next 4 ingredients. Bring to boil; reduce heat and simmer uncovered 30 minutes. Remove ham hock; remove meat from bone, chop and return to soup. Stir in salt and pepper. 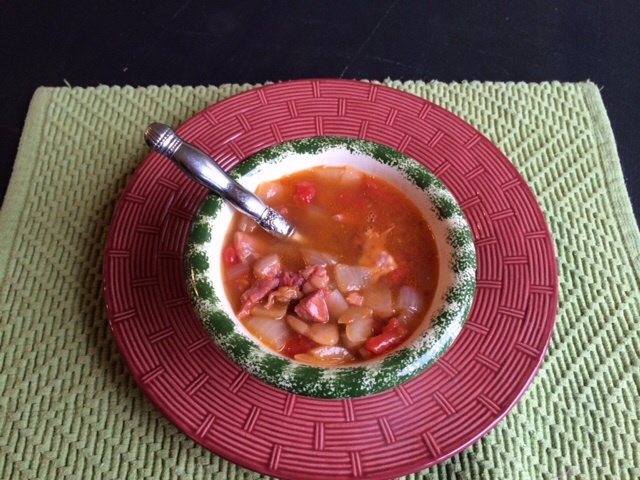 This entry was posted in Recipes and tagged French market soup, ham hock, ham leftovers, ham soup. Bookmark the permalink. Reblogged this on Let's Eat!.